1. A long stretch of weekend time with no official plans. 2. When parties are cancelled. 4. The relief you feel when you don’t have any plans after work and you start Daydreaming. Daydreaming and Fantasies can be a source of creativity and problem-solving. We live in a culture that thrives on socializing and group brainstorming. But some of the best ideas aren’t born in a noisy boardroom–they come quietly into the world when you’re alone at your desk, letting your mind wander. Indeed, visionary Steve Wozniak, a self-identified introvert, worked by himself for months and created what would eventually become the Apple computer. 5. When you can email or IM a company for customer service instead of calling. 6. Go on a date with yourself. Go on a date with myself. Sometimes it’s a movie and dinner date, a trip to that quaint used-book shop, splurging time at the stationery station at the book store, other times a walk exploring the city. 7. Ignoring your phone for awhile. Sometimes I am just out of the energy to deal with all those texts and emails. 8. Having the hobbies and bedtime of a senior citizen. I am an old soul, and that’s OK. Do the crafty stuff: sew, crochet, paint, doodle, revamp old stuff, etc. 10. Having a quiet drink at home with your partner instead of going to a loud bar. Because I can actually have a conversation without talking much! 11. Driving solo for long periods of time. You can get so much thinking done and blast whatever kind of music you choose. 12. Recharging after a long stretch of socializing. Because it’s so much easier for you to process your thoughts by writing them down than by speaking them. Writing is fantastic because it doesn’t involve anyone else directly, but is indirectly one of the most intimate forms of communication. As it is also in their nature to consider carefully what to say before they actually open their mouths, writing seems to be a better communication channel than speaking since it grants them more time to consolidate their thoughts before they respond. 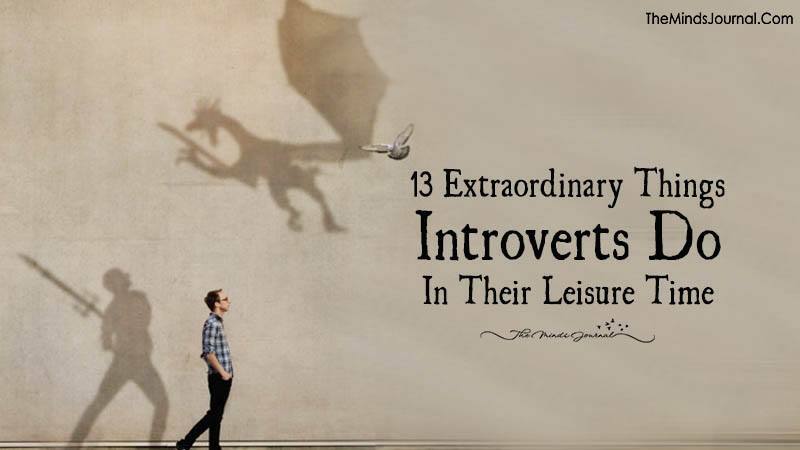 For these reasons, introversion gravitates one towards writing and had produced many of the world’s greatest playwright, poets and writers, from William Shakespeare, J. R. R. Tolkien, Emily Dickinson to J. K. Rowling. The introverts’ constant need to disengage and recuperate themselves from all the social interactions is actually a plus here, because such solitude repeatedly offers them the time and space to assess the situation.